With the increasing life span of people in most countries and aging identified as the major risk factor for the development of it, dementia has become a major health care problem. With no effective prevention or treatment on the horizon, the number of people with an irreversible dementia is rapidly increasing. There are currently 5.2 million Americans with Alzheimer's disease and other dementias, a number projected to increase to 7.1 million in 2025 and to 13.8 million in 2050.1 Alzheimer's disease is the only disease among the top 10 causes of death in America that cannot be prevented or cured, and there is no medication that will significantly slow its progression. Therefore, there exists a great need for the development of strategies that will provide effective, affordable, and compassionate care for people with dementia, enabling them to live with quality in their lives, both physical and cognitive, throughout the progression of their disease. • Psychiatric conditions that are unrecognized or untreated may lead to a significant decrease in quality of life in individuals with dementia. The most important of these is depression, which is very common in people with dementia and is often undiagnosed and undertreated.8 Depression is a risk factor for rejection of care, escalating into abusive behavior,9 and for agitation.10 Other conditions that can decrease quality of life are hallucinations, if they become disturbing to an individual with dementia, and apathy, an often unrecognized condition that can result in weight loss11 and failure to thrive. • Unrecognized or undertreated pain can also decrease the quality of life of people with dementia. Pain is very common in these individuals,12 who often cannot verbally report their pain, describe its location, or characterize its severity. Several programs attempting to improve the quality of life for people with dementia have been developed, each of which addresses one or more of these factors.13 However, some of these programs exclude people with advanced dementia14 and some require additional staff,15 which is not always realistic in the current fiscal environment of nursing home facilities. Therefore, there is a need for a comprehensive program for individuals with advanced dementia that is sustainable over time in the long term care setting without additional funding. Namaste Care, a program that fulfills these criteria, is described below. Namaste Care, a program developed in 2003 by Joyce Simard, MSW, can be found throughout the United States, Australia, the United Kingdom, Greece, and the Czech Republic. It is described in detail in the second edition of the book The End-of-Life Namaste Care Program for People with Dementia, published by Health Professions Press in 2013. Namaste Care is suitable for residents with advanced dementia as well as for residents who do not benefit from traditional activities. 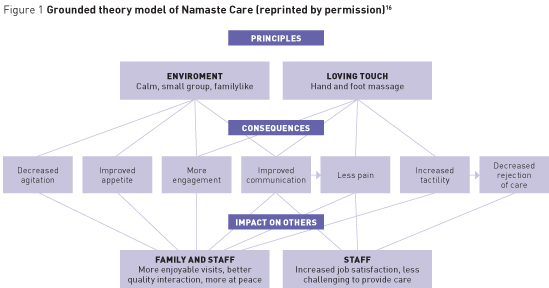 A study in a United Kingdom nursing home, which showed that Namaste Care increased the quality of life of participants, provided qualitative data from questionnaires returned by staff and family members.16 The data from this study were utilized to develop a grounded theory model of Namaste Care. This model indicates that the two main principles of the program are comfortable environment and loving touch (See Figure 1). A comfortable environment includes space that is available for at least two hours in the morning and two hours in the afternoon for the Namaste Care program. Namaste Care involves a group activity, requiring space adequate to accommodate eight to 10 residents in reclining wheelchairs or lounge chairs. The optimal space is a room that can be secured so that supplies can be safely stored when not in use for the program. If a dedicated room is not available, other rooms can be adapted. Often the dining room is used. When the residents finish the meal, the room is cleaned and then made to look as homelike as possible. Namaste Care does not require additional staffing. The number of residents in the room must be at least equal to the ratio of nursing assistants to residents. One staff person, usually a nursing assistant, is assigned to the program, scheduled to begin after most of the residents have completed their breakfast and to end before lunch. The afternoon session typically begins at 2 PM and continues until 4 PM. A Namaste carer is always present in the Namaste Care room; the residents are never left alone. Teamwork is vital in making the program succeed. Because a Namaste carer may not have all of his or her assigned residents in the program, other staff members watch his or her residents while he or she is caring for other staff members' residents. Occasionally activity professionals lead the program. Establishing Namaste Care does not require additional staff; however, it simply requires reassignment of residents for the program's duration. The person conducting the program might be either a nursing assistant who likes the program and provides it for the entire day or several staff members who rotate in the Namaste Care room. Loving touch is the second main principle of Namaste Care. In contrast to usual care that is task oriented and provided in a time-efficient manner, the care provided in the Namaste Care room is compassionate, slow, and person centered. Loving touch includes massage of hands and feet, applying to residents' faces a moisturizing cream with a scent reminiscent of the past, and carefully brushing residents' hair or providing a gentle scalp massage. This loving touch approach to care includes the Namaste carer talking to the resident, regardless of his or her ability to speak. Participation in Namaste Care addresses all of the factors listed above that decrease the quality of life. A comfortable environment and the presence of others decrease agitation18 because the residents are no longer isolated. The participants also experience reduced apathy, which promotes improved appetite and prevents weight loss.11 Namaste Care participants are offered beverages on a continuous basis to prevent dehydration, which can result in hospital admission.19 The continued presence of the Namaste carer and the chance to be with other residents provide the opportunity for engagement with others and the environment. The loving touch activities described above engage the resident as well. Increased engagement provided by the program director, volunteers, or other residents increases the communication ability of the participants. Maintaining quality of life for patients with advanced dementia requires attention to the individual needs of each resident. Namaste Care is a program that provides this attention without additional staff or major expenses. Therefore, it could be implemented in all facilities that provide care for individuals with advanced dementia. — Ladislav Volicer, MD, PhD, FAAN, FGSA, a professor at the University of South Florida School of Aging Studies in Tampa, also has academic appointments at the Charles University in Prague, Czech Republic, and the University of Western Sydney in Australia. 2. Volicer L, Van der Steen JT, Frijters DH. Modifiable factors related to abusive behaviors in nursing home residents with dementia. J Am Med Dir Assoc. 2009;10(9):617-622. 3. Volicer L. Is your nursing home a battlefield? J Am Med Dir Assoc. 2012;13(3):195-196. 4. Rochon PA, Gruneir A, Gill SS, et al. Older men with dementia are at greater risk than women of serious events after initiating antipsychotic therapy. J Am Geriatr Soc. 2013;61(1):55-61. 5. Volicer L, Simard J, Pupa JH, Medrek R, Riordan ME. Effects of continuous activity programming on behavioral symptoms of dementia. J Am Med Dir Assoc. 2006;7(7):426-431. 6. Simard J. Silent and invisible; nursing home residents with advanced dementia. J Nutr Health Aging. 2007;11(6):484-488. 7. Sloane PD, Davidson S, Buckwalter K, et al. Management of the patient with disruptive vocalization. Gerontologist. 1997;37(5):675-682. 8. Volicer L, Frijters DH, Van der Steen JT. Underdiagnosis and undertreatment of depression in nursing home residents. Eur Geriatr Med. 2011;2(6):332-337. 9. Galindo-Garre F, Volicer L, Van der Steen JT. Factors related to rejection of care and behaviors directed towards others: a longitudinal study in nursing home residents with dementia. Dement Geriatr Cogn Dis Extra. 2015;5(1):123-134. 10. Volicer L, Frijters DH, Van der Steen JT. Relationship between symptoms of depression and agitation in nursing home residents with dementia. Int J Geriatr Psychiatry. 2012;27(7):749-754. 11. Volicer L, Frijters DH, Van der Steen JT. Apathy and weight loss in nursing home residents: longitudinal study. J Am Med Dir Assoc. 2013;14(6):417-420. 12. Van der Steen JT, Regnard C, Volicer L, Van Den Noortgate N, Sampson EL. Detecting pain or distress in people with dementia: an appraisal of two strategies. Eur J Palliat Care. 2015;22(3):110-113. 13. Morley JE, Philpot CD, Gill D, Berg-Weger M. Meaningful activities in the nursing home. J Am Med Dir Assoc. 2014;15(2):79-81. 14. Spector A, Thorgrimsen L, Woods B, et al. Efficacy of an evidence-based cognitive stimulation therapy programme for people with dementia: randomised controlled trial. Br J Psychiatry. 2003;183:248-254. 15. Graessel E, Stemmer R, Eichenseer B, et al. Non-pharmacological, multicomponent group therapy in patients with degenerative dementia: a 12-month randomized, controlled trial. BMC Med. 2011;9:129. 16. Manzar BA, Volicer L. Effects of Namaste Care: pilot study. Am J Alzheimers Dis. 2015;2(1):24-37. 17. St John K, Koffman J. Acceptability of Namaste Care for patients with advanced dementia being cared for in an acute hospital setting. End Life J. 2015;5(1):e000013. 18. Stacpoole M, Hockley J, Thompsell A, Simard J, Volicer L. The Namaste Care programme can reduce behavioural symptoms in care home residents with advanced dementia. Int J Geriatr Psychiatry. 2015;30(7):702-709. 19. Phelan EA, Borson S, Grothaus L, Balch S, Larson EB. Association of incident dementia with hospitalizations. JAMA. 2012;307(2):165-172. 20. 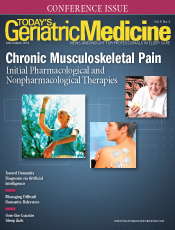 Fullarton J, Volicer L. Reductions of antipsychotic and hypnotic medications in Namaste Care. J Am Med Dir Assoc. 2013;14(9):708-709.